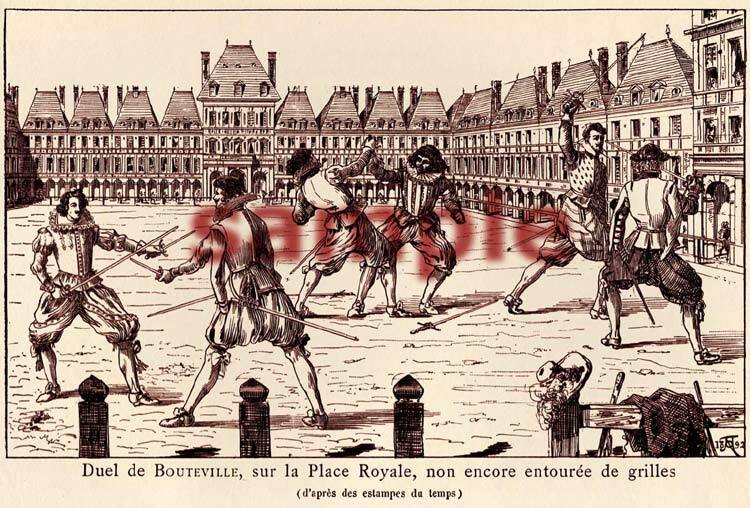 The Comte de Bouteville was a French nobleman in the court of Louis XIII who was a notorious and unrepentant duelist. Bouteville fought twenty-two duels between the ages of fifteen and twenty-eight. During this era it was the custom in an affair of honor for the seconds to join in the combat along with the two principles. On this occurrence Bouteville was seconded by his relative the Count de Rosmadec and Sieur de la Berthe. Beuvron brought his esquire whose name was Choquet and the Marquis de Bussy d’Amboise. The combat was ferocious and brief. Bouteville and Beuvron fought each other to a standstill and spared each other’s life without injury. Bussy died from a wound to the jugular vein, La Berthe was wounded, Choquet escaped to England with the principle Beuvron, while Rosmadec was later arrested along with Bouteville and thrown in the Bastille. Shortly thereafter, both Bouteville and Rosmadec were executed for violating the King’s edicts against dueling.